I have to nail my colours to the mast straightaway and say I am generally of the opinion that opera should be performed in the language intended for it by the composer. So it is a surprise (and a happy one) to report that this English language version of Wozzeck is an almost unqualified success. This is probably due to two things. One is that the German language lends itself better than most to being translated into English. The other is the quality of Richard Stokes�s version, which is intelligent, literate and, above all, musical. 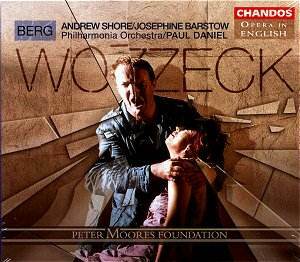 I have a number of CD versions of Wozzeck in my collection, as well as two video productions. My long-standing favourite is Dohnanyi with the VPO on Decca, sumptuously recorded, superbly played and with outstanding vocal leads. Whilst this new English version is unique from the language point of view, it is possible to compare all other aspects, and the Chandos is not wanting in any major area. I was privileged, in the early 1990s, to see the Opera North production on which this recording is based and remember vividly being bowled over by Andrew Shore�s memorable assumption of the title role, as well as Deborah Warner�s spare, Expressionist production. I was also mightily impressed by Paul Daniel�s handling of the orchestra. In his hands we were treated to an almost Straussian richness of sound, a revelling in Berg�s originality of texture and a keen ear for the longer line, so that detail did not overtake the bigger picture. Ten years on, Shore�s performance has matured into something deeper and even more moving, and Daniel�s conducting has similarly accrued the kind of authority that puts it up with the best. Although Wozzeck is an ensemble piece, it is important that the two main protagonists, the pathetic anti-hero Wozzeck and his �harlot with a heart� partner Marie, are totally believable. Some recorded performances (Fischer-Dieskau comes to mind) rather ham it up, overdoing the sprechstimme and going over the top in certain scenes, such as the death of Marie. Andrew Shore strikes me as achieving a near ideal balance of mania, helplessness and nobility. He is determined that we should not just feel sorry for Wozzeck�s plight, but that we should understand the wider social implications � that Wozzeck is a victim of the system. The very opening sets the scene perfectly; Wozzeck is shaving the Captain, his immediate superior, who taunts and mocks him constantly. Wozzeck responds monosyllabically �Just so, Herr Hauptmann�. When we get to the great four-note refrain that acts as a kind of humanist motto �Wir arme Leut� (usually translated as �We poor folk� but here set as �Wretches like us�, which perfectly fits the musical pattern), Shore and Daniel broaden the phrase just a touch, investing it with the kind of dignity that Berg surely intended. This is one example of many throughout the performance where Shore illuminates phrases, responding to the excellent translation with real insight. He does not really let go until the final act, where he wanders around desperately yelling �Murder, murder!� in a state of crazed panic, yet even here we feel someone should help him instead of condemning him, as we know would happen. As Marie, Dame Josephine Barstow gives a performance of equal depth and sincerity. At times she doesn�t quite sound common enough, with a rather cultured �opera� accent apparent in some of the venomous exchanges with Margret (Act 1, scene 3). But she is unbearably moving in Act 3, as she reads to her child from the Bible the story of the adulterous woman. Her exchanges with Wozzeck tingle with tension. When she finally gives herself to the Drum Major at the end of Act 1, her delivery of the words �Why should I care? Who could give a damn?� seem to sum up the whole tragedy of her pitiful life. Talking of the Drum Major, there�s a marvellously bullish portrayal from Alan Woodrow here. He does not shirk from the extremities of the character, which are here highlighted by the translation. As he drunkenly assaults Wozzeck in the barracks (Act 2, scene 5) he pulls no punches with the lines �Bas**rd, shall I rip your tongue from your gullet and wrap it round your f***ing neck?� This is typical of a scene where one is shocked anew at the effectiveness of this piece in English, almost like hearing it for the first time. All the other characters seem to relish being able to sing a translation of this quality; indeed, I was happily able to read through the full text (included in the booklet) just for the sheer pleasure of the language. The Philharmonia Orchestra plays superbly, and though they may not have the razor-sharp ensemble of Dohnanyi�s Vienna forces, the strings display great tonal weight and the many instrumental solos have real character. In Daniel�s expert hands, the famous D minor Interlude, effectively a symphonic summing up of the opera, has opulence and gravitas and sounds (quite appropriately) like a miniature Mahler slow movement. Certainly the recording Chandos gives them helps the aural experience, with superb presence, clarity and bloom on the sound. Notes are by a staunch supporter of this Chandos series, the Earl of Harewood, who gives his own interesting slant on the piece, including his first acquaintance with it in Boult�s famous 1949 concert performance. Wozzeck is a relatively short opera and many, including Dohnanyi, include a filler (in his case, a superb performance of its spiritual ancestor, Schoenberg�s Erwartung). There is nothing here, though I understand Chandos are offering the set at mid-price. This should entice people to try it, for it certainly provides many new insights and rewards, and makes comparison almost pointless. Whether you feel (like me) that you really know the work, I guarantee this is worth hearing, and will give you a fresh and illuminating perspective on one of the twentieth century�s most harrowing and original masterpieces.